If you're a professional that has certain specialized areas that you're an expert in, you can include those specialties here. Provide the email address that you want customers to use to contact your company. Add the person within your company that you want customers to contact. Provide your company's contact telephone number here. Enter you company's website address URL here. List any keywords that someone may use to search for your business. Include your company's physical street address. Enter your Facebook profile or business page here. Enter your Twitter profile URL here. Enter your LinkedIn profile URL here. 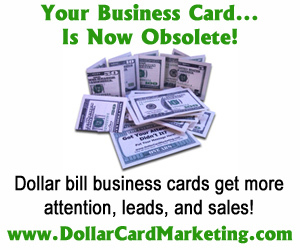 Get Your Business In Front of Customers Looking for Offline Marketing Products & Services! You're about to give your business a MAJOR boost by taking advantage of the most comprehensive offline marketing business directory on the Internet. Businesses are tired of paying outrageous pay per click fees and exorbitant fees charged by other online business directories that only bunch them in with thousands of other unrelated businesses. This is your opportunity to present your product or services to a targeted demographic of business owners and managers that are specifically looking to take their marketing efforts offline.